For a long time, hog hunting was looked at like a second-rate pursuit. However, hunters across the country have come to appreciate the opportunity to hunt these invasive pigs with very few season restrictions, plus generous bag limits and the ability to fill the freezer. Tune in to The Revolution this week as we talk all things feral hog hunting with our panel of pros. We’ll be joined by Fred Eichler, host of Predator Nation and Hal Shaffer from Greg Zipadelli’s Drop Zone with hog hunting tips. In addition, Jerry Courtney with Ranch Hand will drop by to explain how their grille guards and bumpers add extra protection to your vehicle. These "Pig Pursuits" on The Revolution are presented by Outdoor Channel, Sportsman Channel, World Fishing Network and MyOutdoorTV. It’s part of an annual hunt ahead of the Daytona 500, where the crew from Greg Zipadelli’s Drop Zone, seen on Outdoor Channel, pursue monster Florida hogs. Hal Shaffer, co-host of Drop Zone is right in the middle of the action and he joins us this week on The Revolution. Some people see hogs as an "easy" hunt, however Hal says that the big hogs require skill to get on. Their acute hearing and incredible sense of smell can tip them off to the presence of a hunter really quickly. If you get past their senses, you then have to contend with a boar’s shield. Hal tells Jim and Trav that the right broadhead and shot placement are key. Listen in to find out what broadheads he recommends to drop a hog in its tracks. Hal also talks about the aggressive nature of feral hogs, their lack of natural predators and how they pose a threat to fawns. 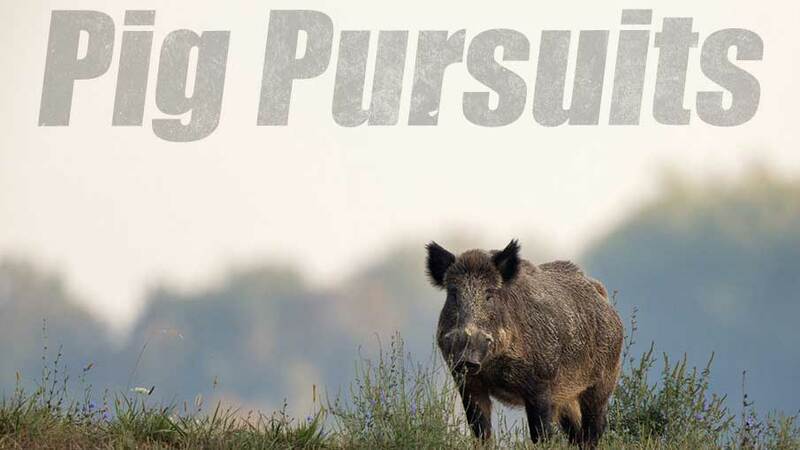 There is no wrong way to hunt a feral hog and Fred Eichler, host of Predator Nation on Sportsman Channel, has done it all. Tune in to The Revolution this week as Fred talks hunting hogs with archery equipment, firearms, hunting from a helicopter, using hog dogs and so much more in your pursuit to put bacon in the freezer. As an avid bowhunter, Fred tells Jim and Trav that there are a few things you need in order to take down a tough boar. First, hunters need a good cut on contact broadhead that can get through that thick shield. However, just as important, an archer’s arrow flight needs to be spot on. An arrow that is wobbling and kicking in the air will lose penetration from not hitting straight on. When it comes to firearms, Fred will dish on his favorite caliber, the .308, and his preferred hog load. Finally, he’ll talk about his passion for hunting behind dogs as well as the thrill of hunting them out of a helicopter. Once he put aside his initial hesitations about hanging out of a helicopter, Fred says that it’s a rush. Tune in for this fun two-part interview with Fred Eichler! We’re talking trucks this week with Jerry Courtney the VP of Marketing for Ranch Hand. For those of you not familiar with Ranch Hand, here’s what you need to know. In the great state of Texas, every day, a group of people are looking out for your safety on the road. Ranch Hand builds grille guards, front bumpers, back bumpers and running steps from steel. These accessories don’t just add to the look of your vehicle, they also play a big role in the function and overall safety of your vehicle. Tune in as Jerry discusses how front-end protection can protect you from animal collisions and more serious accidents. He’ll also talk about their Impact Tour, a chance for people to see what a vehicle looks like from a real accident after it fell 40 feet off an overpass ramp and how the addition of a front bumper from Ranch Hand aided in protecting the driver. Tune in!